On Sunday 26th January 2014, with a much delayed 7:45 face off at Nottingham’s Capital FM Arena the Bulldogs faced the Jaguars. At the home game back in September we took the points beating them 12 – 0, so our expectations were high. The game started fairly even, with a number of shots on Nottingham net minder Holly Steeples, and a couple on Andy Button. But at 3:52 Nottingham’s James Beatty and Bulldogs Max Broadhurst were both given 2 minutes for boarding and again at 9:08 Adam Barnes also sat 2 minutes for boarding. It was not until 13:46 that Ryan Kemp found the back of the net assisted by Adam. At 14:44 Max was blown on an elbow penalty which caused Nottingham’s number 14 & 16 to have a go at him, they all sat for 2 minutes leaving the players 4 on 3. Connor Parkin took the advantage and scored the power play goal at 15:26 assisted by Adam. The end of period score was 2 -0 to the Bulldogs. The second period started and the Bulldogs again had the Jaguars in their zone for much of the time. At 24:55 a frustrated Jaguar, Thomas Woodward was sat for 2 minutes for an interference penalty. At 29:53 Ryan again found the back of the net assisted by James Royds and shortly after at 32:38 again Connor scores assisted by Max, followed by a great goal from Abbie Culshaw, assisted by Max and Josh Richardson at 33:47. At 34:16, around the Bulldogs net Andy Button saves a shot on, but the Jaguars find the rebound, and sneak the puck in when Andy wasn’t in the area. End of period score is 5 – 1 to the Bulldogs, with no penalties. At the end of the period there was an ice cut on this already late running game, so at 9pm we all went back to the changing rooms. Glenn then informed us that Sutton had beaten Sheffield, the league leaders, so our two points were very much needed to take us two points behind them! In the third, the game was on, the Nottingham net minder was obviously tiring, and the Nottingham team were 1 man down due to an abuse penalty from the bench; so at 41:08 the Bulldog Captain, Connor Parkin scored his hat trick power play goal assisted by Abbie and Max, this was very closely followed at 41:57 by a first goal of the evening from Adam, assisted by Ryan and Hannah. At 43:11, Jay was sent to the penalty bench for elbowing. Whilst short handed, the Bulldogs kept the puck in the Nottingham zone for most of the two minutes. At 46:15 Ryan scored his hat trick goal, assisted from Adam, and this goal said goodbye to the Nottingham keeper. With the new keeper between the pipes, and showing us he could do the splits the game got underway again. In just over a minute at 47:43 Ryan scored his fourth goal again assisted by Adam. At 52:22 a scuffle around the Nottingham net and following a rebound found James Royds ready to push the puck into the net with his first goal this game. At 53:07 James Birtwistle was sent for a two minute sit for elbows. As soon as Bradford were back to full strength Ryan again found the back of the net with a fifth goal, this time assisted by Lewis Baldwin at 55:12. Thirty seconds later Adam scored his second goal assisted from Ryan, giving the final score 12-1. Shots on goal to Andy were only 24. Shots to the Nottingham keepers were 62 in total. Well done to all of the team. Man of the match award went to Team Captain Connor Parkin. It was 10 pm and we were all in Nottingham, on a school night, but we WON!! Now the U18 Bulldogs are only two points below the top of the league. Stingrays to the fishmongers for a battering! Mons Meg bowed her head in admiration as Jordan Griffin hurled a torrent of powerful shots into the Stingray defences. With devilish trickery Tom McFadden weaved his magic leaving the opposition floundering and Alex Graham, like the Pied Piper, lead a shoal of unaware rays to open up the net. 12:30 start on a wet and windy day. 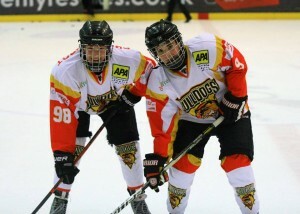 The Bulldogs were back in action on Sunday against the Billingham Stars. The Bulldogs had Captain Max Broadhurst back after a long layoff with a broken wrist and Lachlan Brownrigg making his home debut for the Bulldogs after his transfer from Manchester Phoenix in December. The first period was a scrappy affair with the Bulldogs constantly putting the Stars under pressure, the Bulldogs were not at their best but had more than enough to deal with a Stars team which lacked any depth. Max Broadhurst opened the scoring in the second minute with an assist from Josh Richardson. Goals followed from Lachlan Brownrigg, scoring his first for the Bulldogs in the sixth minute, Adam Barnes netted in the ninth, Lewis Baldwin hit a thunderbolt from the blue line in the eleventh minute, Josh Richardson netted twenty seconds later and Adam Barnes completed the scoring in the twelfth minute. The period ended 6-0 for Bradford. The second period continued as the first with the Bulldogs having the majority of the chances however the Stars Net minder Callum Reynolds managed to keep the score down. The Bulldogs were not playing with the style we watched against Hull or Nottingham and were finding it hard to get their passing game going. Then in the twenty third minute Lachlan Brownrigg broke through the centre and one on one with keeper finished in style to make the score 7-0 to the Bulldogs. Kieran Brown added another in the twenty sixth minute with the period finally ending with the Bulldogs leading the game 8-0. The third period started with the Bulldogs still in control but still struggling to find their passing game. The Stars were working hard and trying their best to find a way through. Then in the thirty fifth minute the Bulldogs got another well-deserved goal from the hard working Bob Boyden. The Stars sneaked a scrappy goal in the forty first minute when Ben Robinson netted a goal which was greeted like a Stanley Cup win from their players and supporters. The Bulldogs scored three more goals in the last three minutes two from Max Broadhurst and one from Ryan Kemp This Bulldogs team had more than enough to win this game even when not at their best.